Sydney, Australia - First he refused to go quietly when his synagogue tried to make him redundant. Now the intransigent Rabbi Moshe Gutnick refuses to go overseas to have his employment dispute heard by an independent tribunal. The Bondi Mizrachi Synagogue, which says it can no longer afford Rabbi Gutnick, asked the Supreme Court to send the dispute to the London Beth Din, saying there was nobody in Australia who had the authority to hear the matter and did not have a compromising relationship with the influential clergyman. But the rabbi says it would be prohibitively expensive to send him, his solicitor and his counsel on business-class tickets to London and accommodate them for five days to have the matter heard. The court blocked the synagogue from making Rabbi Gutnick redundant last month by granting an injunction against a board vote that was to be held. Rabbi Gutnick’s part-time job costs the synagogue $80,000 a year, but he says the board does not have the power to sack him because it granted him lifetime tenure. He says his redundancy package is worth more than $1 million. The London Beth Din has indicated it is willing to hear the matter on June 1. Yesterday Justice Patricia Bergin adjourned the matter to investigate whether the London group could change its date to accommodate a trip by Rabbi Gutnick from New York, where he will be on June 1 for his daughter’s wedding. Justice Bergin said the New York trip presented the perfect opportunity for the rabbi to travel to London if the date of the London Beth Din could be set back. This guy is becoming a real embarrasment to the community. First, he refuses to accept the decision of his olam to terminate his contract because they cannot afford to pay him. Now he refuses to go to London to argue his case. If he doesn't show up he should lose by default just as if someone does not show up in civil court. He has been given a chance I didn't believe he deserves but now he demands his appeal be heard on his terms. sounds like the shul is trying to be unreasonable and blaming him. They couldn't come up with a more reasonable decision? Gotta love the need for "business class" tickets! why does a Rabbi, who is a servant of the commuity, need a business class ticket? Why can't he get local lawyers? No disrespect or anything but why not? Although I am generally anti Chabad and would be the first to mock and denigrate the Chabad Rabbi; I am happen to have worked with him and actually know him well. He always flies Business class and he travels regularly for the Sydney Beth Din as their Av Beth Din. It is therefore not unrealistic for the man to expect to travel Business class to London which for all you Americans that think the world revolves around New York is a 24 hour flight with a stop in Asia. Have a little rachmonus. Why don't they do it by teleconference? “ why does a Rabbi, who is a servant of the commuity, need a business class ticket? Exactly. He can go on an economy ticket, and he has mishpacha with whom he could stay. When he goes for his own purposes he doesn't stay in hotels. “ sounds like the shul is trying to be unreasonable and blaming him. Where else should they go? What beis din in Australia could hear the case? This was the shul's taana all along; he was the one who said they should bring dayonim from the London Beis Din, and the shul said it was too expensive. Now the proposal is that instead of bringing dayonim the parties go to London, and he says it's too expensive too? Then what does he propose? He is not a guy, he is a rav of the shul, a chalachic authority. There is nothing unreasonable in asking for a more accommodating court date. In civil courts it is done all the time and most time it is granted almost automatically. If you read the article carefully you will see that the court date is June 1 and the rav' daughter's wedding is on the same date. You are all incorrect. I believe that what he is seeking is that if the shule eventually sells their building (worth millions) he should be paid what is owed to him. As usual everyone here has a knee jerk reaction without thinking or investigating the facts. They do not dispute what is owed to him and he is not asking for the cash now, rather put a lien on the building for money owed to him when/if they sell the shule! Though I have some limited issues with his fighting in this matter, I can understand the he feels he has a contract, and that breaking a contract is just not right. When one takes on a job like that and negotiates a contract, he bases all his financial decisions, with involve children's future as well as one's own, on the terms of that contract. One naturally assumes the other party will keep his end of a contract. I can also certainly understand his stand on the VERY high cost of making that trip to London. We are not talking about a Cleveland Rabbi refusing to go to Brooklyn. We are talking about from Australia to England!!!! ".... it would be prohibitively expensive to send him, his solicitor and his counsel on business-class tickets to London and accommodate them for five days to have the matter heard. " That is a resonable objection. It makes sense for him to ask for a different date when he can afford to go, and not insist on a date he can't make. I don't understand what argument the congregation has. One does not make a person redundant when they have a lifetime contract!!!!! .... unless they person willfully and clearly was in violation of the terms of that contract. Sure, if he was the rabbi of a shul, and they caught him doing some major avairos, they have a right to sack him. But, ...... redundancy due to lack of money???? What does that mean? Does that mean, "We have the money for 16 new programs, but we will pay for them by firing this rabbi and using that $80,000 to pay for these new programs?" If so, keep your contract folks. Doesn't the word of a Jew mean something today? That contract for the rabbi's life was the kehilla giving the rabbi their word that they will keep him, and that he will never need to look for another job again. Time to get off my soap box. My wife just walked in. He is demanding that they keep paying him, even if it drives them into bankruptcy and forces them to sell the shul. They are saying that without the burden of his salary, they may not have to sell, and can continue in their reduced circumstances; they'd rather have a shul with no rov than no shul and no rov . So the question is whether his contract is more important than the continued existence of the kehillah. Is he a servant of the kehillah or its master? Does the position of rov exist to serve the kehillah, or does the kehillah exist to provide a living for the rov? There are many Borough Park shtiblach that openly exist for the purpose of providing the rov with a living; that is certainly not the case in normal shuls such as Mizrachi. If he forces the shul to close rather than forego his salary then he is not serving the kehillah, and thus doesn't deserve his salary. He has enough to do with the Beis Din and the Kashrut Authority; let him concentrate on those. “ Though I have some limited issues with his fighting in this matter, I can understand the he feels he has a contract, and that breaking a contract is just not right. Yes, it's reasonable to worry about the expense: so why is it that when the shul made exactly that argument, R Gutnick went to court to insist on taking it to beis din? He wanted to take it to a din torah, and he prevailed in court to force it to a din torah, now let him go. If the LBD will change the date, fine; but that's up to the BD, not to him or the shul. It's not as if Justice Bergin can change the date of the din torah! All she can do is suggest that they ask the BD for a different date. Redundancy by definition means that there is NO allegation that he has done something wrong. The POSITION is made redundant, not the person. What 16 new programs are you talking about? Rabbi Gutnick is an amazing and honorable person and a real mentsh. Its a pity that he has to go through all this when he dedicated himself to go to Australia when it wasn't so popular and dedicate himself to the Jews of Sydney. 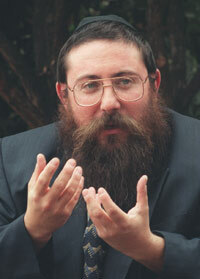 Rabbi Gutnick did not "go to" australia, he IS Australian. born in Melbourne. yeah, i was just gonna say - why can't they make it a skype teleconference? Business class? Halevei! Let him travel sardine like the rest of us plebs. I know plenty of people who fly from UK to Oz to visit their kids & they suffer in coach. What a wuss. A little humility here is in order. Rabbi Gutnick might be wonderful. But when your congregation doesn't want you, leave. Get out and get a life elsewhere; they are not the last congregation on earth. Drop the lawsuit and pick up the phone and get a better job somewhere else. They paid enough already. Chabad does not need your rachmonus. Shame on you for your sinas chinam. It's going to be an interesting case: will a Beth Din order the sale of a shul to pay the rabbi? Because that's what it boils down to. The shule has no money and their only asset is the property. To pay the rabbi would mean selling the shule, or taking out a huge mortgage which the community could not pay because they don't have enough members at the moment to even pay the rabbi. “ Gotta love the need for "business class" tickets! Lets say he wins the case? How is he going to stand in front of his cong. and expect their respect, when they have told him in no uncertain terms "We dont want you here"? It seems to me that he will be forcing his authority on them when they dont want it. How can that be healthy for a rov and his community???? I think he should make a clause with them that if they sell up, he gets $x, and he should go elseswhere, for his own sake and his own financial peace of mind. Soon there will be no more shules left in Sydney. I agree. A settlement clause of say two years salary. Your all funny, do you know how a shull board works ? it can be 5 machers kicking him out.. why dont they have a referendum of all congregants ? Would you trade 2 years for 'the rest of your life'? I think not. That is all very nice. But he still has to support himself and his family. He built his dreams and family plans based upon a CONTRACT which is a lifetime contract. If there IS a clause originally fine. But, if not, they cant "make a clause" now. This is not a matter of the future effectiveness of a Rabbi. This is a matter of a contract between a company (the shul) and an individual (the rabbi) who has a right to tell the company to abide by the terms of the contract. Then, YES, sell the shul. A contract is a contract. They are morally bound to keep it. Can't afford it? Sell the building, and move into something smaller. “ Yes, it's reasonable to worry about the expense: so why is it that when the shul made exactly that argument, R Gutnick went to court to insist on taking it to beis din? He wanted to take it to a din torah, and he prevailed in court to force it to a din torah, now let him go. If the LBD will change the date, fine; but that's up to the BD, not to him or the shul. It's not as if Justice Bergin can change the date of the din torah! All she can do is suggest that they ask the BD for a different date. You may make a position redundant, but you need to pay the man with the contract. Should be noted that the way this all started was that the Shule was to have an EGM to vote on the redundancy. For the position of Rabbi to be made redundant, 66% of the members had to vote for it. The Rabbi went to court rather than the Sydney, Melbourne or London Beth Din to prevent the vote. He had three weeks yet chose to go to a secular court three days before the vote. RAV's daughter's wedding is June10th - London would not be inconvenient and he would be close to NY! Yes, they are brothers. Their father was the President of the Rabbinical Counsel of Victoria. There is no "Chief Rabbi of Australia". The Rabbi is no Rachmonas. He is doing very well from his huge Kashrus business that takes up most of his time.! He is only a part time pulpit Rabbi and that is the dispute. Your opening line is comforting. You admit to being everything that a Jew shouldn't be. Ahavas Yisrael, doesn't apply to you and many of the other mitzvos in the Torah as well. How nice to read your description of yourself in these days of Sefira, etc. May Hashem forgive you for your sins and may you do teshuva. From a Chabadnik that loves you! BS"D I was in Sydney for a year and everybody there really likes and respects Rabbi Gutnick. He is responsible for basically all the kashrus in Sydney (the "KA") and everybody across the board trusts him. He is also responsible for the Eruv, which everyone trusts. He is a major lamdan and a kind man. He also has a good sense of humor. Good Luck Rabbi Gutnick in your battle! What other money or income he has is not the point. If YOU had a contract for, let's say, 40 years from a company at $250,000 per year. And, after 5 years they said, "we don't need you any more. We are making your job redundant." Wouldn't YOU fight? It is your money. You may have $500,000 income from elsewhere. You man have a $3,000,000 inheritance in the bank. But that $250,000/yr is yours also. Would YOU throw it out? I know I would not. But, knowing I had that $80,000 per year guarantee, I planned on purchasing, or did purchase a boat or plane, or whatever. It is my business what I do with my money, and nobody else's. I want my money. I would take the shul to court. I don't even understand why it is an unresolved issue. Pay that man what you owe him. I don't care what else he owns, or what other income he has. That is not the issue here. “ Yes, they are brothers. Their father was the President of the Rabbinical Counsel of Victoria. There is no "Chief Rabbi of Australia". That is sometimes because they can't get another, and Chabad is always willing to send someone. This is fine sometimes, if they respect the kehilla they take over. But, sometimes they try to change the kehilla by throwing out their minhagim and instituting Chabad minhagim. In that case, they may have been better off without a rabbi. Who cares what his duties are in the contract. He has a contract, and it should be honored. What "chief rabbi"? Chaim Gutnick was the rov of a small shul in Melbourne. And a very part-time honorary army chaplain. Nothing more. “ Then, YES, sell the shul. A contract isn't a suicide pact. There was a major campaign a few years ago for him to give up the KA because he doesn't have enough time to devote to it, between all his other jobs. Maybe if he gives up the shul, he'll have enough time to do a proper job at the KA. That is precisely what he went to court to stop. “ He is demanding that they keep paying him, even if it drives them into bankruptcy and forces them to sell the shul. They are saying that without the burden of his salary, they may not have to sell, and can continue in their reduced circumstances; they'd rather have a shul with no rov than no shul and no rov . Another point would be to say ... who needs this guy? The community will never want him back. They will never respect him. If he has a lifetime contract, those coming to daven will litlerally be praying for his "lifetime" to be as short as possible. How wonderful. As for this "Rav" - Be a man. Accept that nothing in life is forever. Yes, you have a contract... that will become worthless when they have to sell the shul anyway. Your days there are done. Rather than make a chillul H" out of it, GO FIND ANOTHER JOB, just like anyone else. Although at this point, I'd fight tooth and nail to keep you out of my community because I would never trust you to act in our interest first. The rav of a shul has a responsibility to the kehila first. His parnoso comes second. That is the nature of the job. Take what minimal shred of dignity you have left and go somewhere else.... if anyone else will even have you now. “ What other money or income he has is not the point. If it's stam a company, you don't care whether it goes bankrupt or not, so long as you get what you're owed. Is that the way to treat a shul? If that's his attitude to the shul that he is supposed to SERVE, then why does he deserve a penny? If that's his attitude, then he has shown himself unfit for the duties he contracted to undertake. His contract is to serve the people, not to be their master. Remember that this is not private money, it's momon hekdesh, and it must be treated that way. Can you give an example of a shul in Australia where that's happened? Or in the UK, or SA? “ How right you are. Oh, plenty of people will have him. He's a talmid chochom and a genuinely good person. Even in this dispute it's not as if he hasn't got a case; the shul certainly owes him whatever settlement it can afford, and they should negotiate something. But he has to compromise too. And Rabbi Chaim Gutnic was the President of the Rabbinical Counsel of Victoria. What do you imagine that means? It's a nothing title. The RCV is just a club for Melbourne rabbis. It doesn't actually do anything. The board had to keep him and pay him BUT in return he needed to fulfill his responsibilities as the Rav of the Kehilla. This he stopped doing years ago as he enjoyed the Beis Din and was making Tons of money from his Kashrus businesses. A contract is nothing if he works for other entities instead for the shule that is paying him. Rabbi Gutnick broke the contract. “ He broke his contract! Does his contract prohibit outside employment? I can't imagine that it does. After all, his step-grandfather Rabbi Abramson z"l was the rabbi of Mizrachi for many years, while also being Av Beis Din. In fact all the dayonim on the Sydney and Melbourne Botei Din are also shul rabbonim, and surely their contracts with their shuls don't prohibit this. Now if he neglected the shul that's another matter, but it needs to be proved. You can't just say "he took another job, therefore he neglected his first job". And the shul doesn't seem to be making this claim; they seem to be saying that they'd love to keep him if only they could afford it. They're not looking to hire another rov, they're looking to do without one altogether.